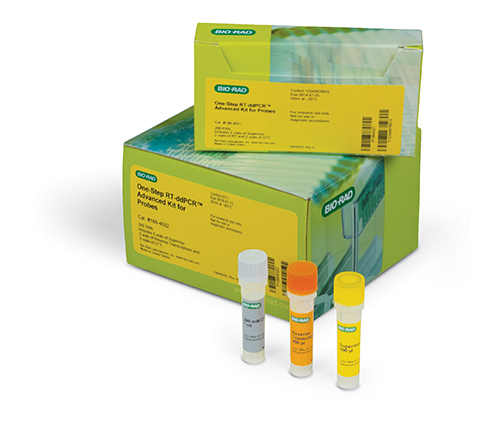 The One-Step RT-ddPCR Advanced Kit for Probes is the latest offering for Droplet Digital™ PCR (ddPCR) reagents. In 2012, a new paradigm was introduced by which researchers could achieve absolute measure of target RNA molecules by combining reverse transcription with ddPCR. The one-step advanced kit updates this single-reaction format with an optimized enzyme and buffer formulation for increased PCR efficiency, specificity, and sensitivity. With the advanced kit, researchers can achieve enhanced detection of rare RNA sequences allowing for detection of small changes in gene expression levels and improved low-level RNA quantification.